Our Premium Goat Milk Melt and Pour Soap Base is opaque and white in color. It contains goat milk, which is an excellent moisturizer and natural emollient. The twenty-four pound big block is ideal for larger projects, as it will make (96) 4 oz. bars of soap. Soap comes in a blue bag with twist tie and corrugate box. A single block measures 13 x 11.5 x 6 inches. Block of soap measures 13 x 11.5 x 6 inches. Package: 24 lb Big Block Melt Point: 119º F.
Sorbitol, Propylene Glycol, Sodium Laureth Sulfate, Sodium Stearate, Sodium Myristate, Sodium Laurate, Goat Milk, Yellow 5, Titanium Dioxide. Sorbitol, Propylene Glycol, Sodium Laureth Sulfate, Stearic Acid, Water, Sodium Hydroxide, Myristic Acid, Lauric Acid, Goat Milk, Yellow 5, Titanium Dioxide. COMMENTS: I love this Base, no problems with it so far, will cont8nue to pu4chase it. "Best Mp Goat milk base "
COMMENTS: Love the creamy goatsmilk, however customers nor ourselves liked the ultra white, detergent free base. COMMENTS: This base leaves your skin feeling soft and silky without that waxy feel. The lather is super luxurious and the product smells great on its own. COMMENTS: I was very leery to try a new soap base but everything else I have tried I love. I must say, this didn’t disappoint! I thought I was buying a great soap base previously from a different supplier but when I tried this soap, I’ll never go back! This soap quality is excellent! It lathers nice even with up to 10% of my additives (depending on what I am adding, I will put a little potassium cocate in theere to keep bubbles comming). It took some getting used to as my old base was much thicker but after making 24lbs in 3 days, i think I have a good handle on how it works for me now! Please never get rid of this base! My goat milk soap flies off the shelves so quickly! Can you please look into also carrying Donkey Milk Soap Base and possibly a Pro base for Goat Milk?!! "goats milk melt & pour"
COMMENTS: I bought this to try to make soap for the first time. super easy to melt and work with. I received my order yesterday & just finished making my first batch. my husband even helped. COMMENTS: Love the ease of use with this product. At first the 24 pound block was a little difficult to wrangler while cutting but it was easily cut and the melt was very easy. COMMENTS: This is a good soap base with a very small amount of bubbles. Like the other goat milk base I've tried it doesn't leave a residue on your body when you wash with it. Leaves your skin feeling soft. It is easy to melt and pour into molds. I really like the crafters choice M&P. COMMENTS: This soap feels really smooth on your skin. Love it! COMMENTS: This soap cuts and melts like a dream. I’ve been using it on its own and as embeds and I’m really happy with it. COMMENTS: It's the best very moisturizing it leaves your skin extremely soft.i have a customer that said it helped her scorisis and didn't break here out. When she told me that i knew I picked the right one. I was using detergent free and I liked it but people said they wanted more bubbles so i order the premium. And it's been a hit. COMMENTS: I LOVE THIS GOAT MILK SOAP BASE, IT IS EASY TO USE. I LOVE THE COLOR.IT HAS TURNED BROWISH IN COLOR BUT NOT TO BROWN WHERE IT HAS AFFECTED MY COLOR IN THE SOAP BAR. COMMENTS: I love this soap! Easy to use, great to work with. Holds fragrances and color! I won't use anything else! "Good but sweated a lot "
COMMENTS: The premium goat milk soap is amazing. It has a good Lather. If Mixed with shea butter is gets hard and does not lather well. COMMENTS: I will not settle for basic, this base is by far the best I've used. COMMENTS: I loved this base but I now use DF! 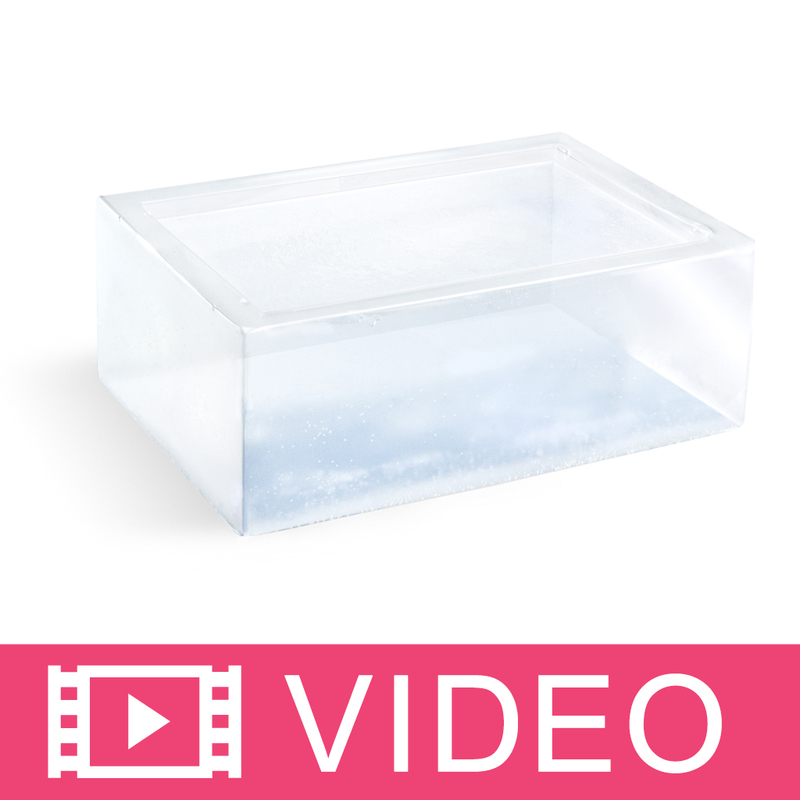 This is a creamy, lovely, lathering base and unmolds great in plastic molds. I never had a problem with it sticking. I just love the DF type now!! "Love the Premium Goat Milk Base!" COMMENTS: I ordered this as a trial. My customers and I are delighted with the luxurious feel of the lather! I now have ordered for the second time, for a farmers market event. The price is well worth it and love, absolutely love that shipping was free! COMMENTS: This is so easy to work with. It takes add ins well too. Holds color or looks great in its natural color which is slightly off white. COMMENTS: This is by far our favorite goat milk base to use. I also love the value in buying it in the 24 pound blocks! Will continue to purchase this product for out growing soap business! COMMENTS: This product is everything it says it is. No surprises. COMMENTS: I have tried goats milk soap bases from several other suppliers, and I always return to WSP. Not only are their prices the best, but I know that I am getting a high quality product that lasts. My customer have raved about the quality of the soap bars created from this base. This in combination with the goats milk powder is a definite best seller for my shop. COMMENTS: This base was very good...easy to melt and pour....my only complaint is it tends to be very thin. Thinner than some I have used, so it seems to take more time to thicken to be able to swirl. "This base is the best! " COMMENTS: I love this base. It is so creamy and smooth. I will never buy another goat milk base. I read the reviews about how it is a pain to get out of bag, but I have not had any issues what so ever! I just gently pull on the bag until it releases out of the soap. "Premium Goat Milk MP Soap Base. I love it!!!!!!!!!" COMMENTS: Starting a new business is never a easy task. I love the Premium Goat Milk MP Base. Its easy to use and takes color and scent very well.The bubbles and lather are awesome !!! My customers are in love with this product. I sold over 80 bars in one weekend. • Love the product easy to use!! COMMENTS: This is bar far the best Goats Milk base I have used. It is super creamy and leaves your skin super soft. Takes well to both color and fragrance. I have added a bubble addative as well to produce more lather. Customers can't get enough of this soap. COMMENTS: This soap is soooo creamy! Lots of lather-this soap is the best! Our Clients love this soap too! It accepts any color and fragrance we add to it and stays true in both consistency and texture. We sell a lot of this soap, in unscented and embellished form. We will continue to buy only the best for our Clients and that includes this soap. Thank you, WSP!! • It could have more of a lather,. COMMENTS: This is the best MP soap base: very very moisturizing, big bubbles, and the best of all leave the skin very soft. I highly recommend this product. COMMENTS: I use this base to make the majority of my M&P soaps and it works great. COMMENTS: I was truly worrid about switching to this larger block but these larger blocks really are not that much harder to work with. "Premium Goat Milk MP Soap Base"
COMMENTS: Love love love the goat milk base. So creamy and mild and best of all my customers love my soaps made from this base. "You get a lot for the money"
COMMENTS: Very pleased with this MP Soap Base. It lathers very well...I will continue to purchase my soap bases from WSP. "Great creamy and bubbly lather." COMMENTS: I love, love, love this soap base. It makes an excellent creamy and very bubbly lather. It also makes skin feel really good after washing. Doesn't dry out skin like some other brands. I use this for all of my MP soap and customers love it. COMMENTS: This is a great soap base that is creamy and rich with a good lather. I am very happy with it. "Premium Goat Milk MP Soap Base "
COMMENTS: This is definitely my favorite soap base. It is so creamy and lathers up beautifully. I combine it with the Detergent Free Honey soap base. Best combo ever. My customers really like it and always ask me for it. I also use it myself and I won't use any other commercial soap product on my face. This is definitely the one to use. • Combines great with other soap bases. COMMENTS: Nice product, creates good quality soap. COMMENTS: I ran out of time to make soap for an event. I purchased this and was very satisfied. My customers love it and now I use it on a regular basis. Very easy to work with. COMMENTS: In my opinion, this is the best base sold. Creamy, leaves skin soft, scents very well. Natural like translucent look. Pops out of molds great. I've never been a fan of goats milk soap, but I had only ever tried cold processed. I love a soft, creamy bar. This stuff is easy and awesome. "Premium Goat Milk Soap Base"
COMMENTS: Even though this is a huge block and not the easiest to work with, I Love the products that I can make with this base! My customers just love the soap products, the lather and the moisture they feel using my soaps. COMMENTS: I have used this base the longest of all the bases from WSP. My customers LOVE it!!!! COMMENTS: I bought this product to make soap as Christmas gifts for friends. I've made several batches of soap as I test out new recipes/ fragrance blends and my family really likes using these "test" batches. I find it lathers up nicely and feels smooth on your skin. "Goats Milk & Honey Lotion"
COMMENTS: This is the very best lotion I have ever tried. I can't keep enough of my 2 .oz travel size lotions in stock. My customers absolutely rave about this product. I scent it with 14 different fragrances and colors to match. I have lavender with the lavender color, garden spa with the green, etc. I don't add any liquid to the lotion, feels great just the way it is. COMMENTS: We have been using this soap years, and we love it! All of a sudden when we got this last shipment, the soap came stuck in a terrible plastic bag. :( The extra time that Wholesale saves by cutting the tub part out of the process, we have to make up for. We've cut up hundreds of boxes of Goats milk soap base and seen many other minor changes, but now we are having to pull pieces of plastic out of the melted soap due to the new bagging process. We would strongly recommend going back to a soap base that is not unified with the bag. Other than the new bagging process, we have not been disappointed with anything. We are so grateful for Wholesale Supplies Plus and will continue doing business with you for years to come. WSP Response: I am sorry for the inconvenience this new filling process has caused you. Fortunately this does not seem to be a regular issue, but rather an infrequent one. We have found that using a blow dryer, or heat gun to soften the soap before removing the bag helps greatly when removing the soap. • The 24# size soap boxes are great! • The price/bulk discount are wonderful! • It's so easy to melt and pour! COMMENTS: I ordered the small 2 lbs so often and I love having the block. It is great I enjoy the Goat Milk Soap Base and always having it on hand is wonderful. COMMENTS: It makes very nice lather and beautiful soap. My customers love it. COMMENTS: Love this soap. The way it makes your skin feel. And hold a fragrance very well. "Crafters Choice Premium Goat Milk MP Soap Base "
WSP Response: The soap does not contain excessive water. It sounds like it was overheated and thinned out to a liquid state. To fix this simply melt to 130ºF. • I would make it thicker, less watery. COMMENTS: I love how this soap is harder than other MP Soap bases. No tacky finger prints when holding it. Just smooth dry feel and no sweating. How ever I have no idea why so many are raving about the lather. If you take it straight from the box and use it then yeah you get a lather. But most people don't use it this way. Most want to melt it first so they can add fragrance oil to it. After you do this there is no lather. I had to swipe and scrub my arm in the shower about thirty scrubs in one place before I got a tiny bit of lather. I added only fragrance oil at 3%. Nothing else. This is one of those time's I go Hmmmmmmmmmmm.... Besides the lather problem I love the soap! Wish it had more lather so I could add it to my store. COMMENTS: I really enjoy using this base, its handy having it in a large block. This base has a very creamy lather and washes off well not leaving a slimy film. I use this one in most of my mp soaps. I like offering soap with the skin benefits of goats milk. It dries quickly and hardly sweats, it perfect! I will continue to order it from your company. COMMENTS: Bought this for my melt and pour soap. Excellent excellent excellent love this goat milk soap. Melts easy, pours easy, and comes out of mold easy. Great suds also!!! Will be buying again. "The best lathering goat's milk MP base"
COMMENTS: Want a great lathering goat's milk base MP-this is it! Creamy, rich sudsy lather that lasts, and rinses clean. Usually don't buy bases with SLS, but this is a nice one. And a perfect price range. COMMENTS: I love this base, especially the Low sweat part. Has a creamy lather and makes skin soft and moisturized. Everyone I have given samples to has asked for more. Is also great for sensitive skin. No complaints here! COMMENTS: I use it with a little shea and cocoa butter for extra moisturizing benefits, or just use alone. It's great either way ! I have customers who won't use anything else. My customers love it !! COMMENTS: Great base producing lots of good lather. COMMENTS: This is one of my favorite bases. My customers absolutely love it as well. I find gardeners, woodworkers, and mechanics favor this goat milk base the most. These users noticed an improvement in skin softening upon just handling the soap, and love the lather when actually using it. I continue to purchase this base because anything I do with it sells very fast. "Awesome Base - Premium Goats Milk MP"
COMMENTS: This was my first MP base and I love it and all of my customers love it!!! I recommend it to everyone. It is so moisturizing! Did I say I Love It!!!!? COMMENTS: Cuts easily, makes a ton of bubbles, leaves skin soft and silky, takes color easily, not sticky to the touch, melts quickly and takes fragrance wonderfully! COMMENTS: People love the soap that I make out of this soap base. COMMENTS: I love this base. It is so rich and creamy. I use it particularly when doing soap cakes and soap frosting. It just behaves better for these tasks. Of course, like all of WSP's soap bases it retains it moisturizing benefits nicely. It colors well. I like the plus formula the best. Although, I have found that the detergent free bases are great too. Just depends if your customer prefers bubbles more or creamy goodness. COMMENTS: This was a staple of mine for years. But I love the low sweat better. As with all WSP items, amazing and consistent quality! COMMENTS: Easy to cut and silky smooth! COMMENTS: I love how quickly this melts and doesn't take long until I am pouring my soap into molds!!! "Great, easy to work with base." COMMENTS: Another great base to work with. Very nice creamy texture and produces a nice lather. Almost a true white, only slightly off-white, so colors have a nice end result. No problems with sweating, even living in a very humid environment. Holds scent beautifully over time. Customers absolutely love it. COMMENTS: Love it! I can't imagine using another supplier! COMMENTS: I love this base.. the goats milk is so creamy and luxurious. .
• that it comes in a 24 lb block!! "The BEST GM base ever!" COMMENTS: WSP has the best goat's milk base on the market. Very easy to melt. Nice natural scent. No odor. Leaves your skin feeling soft, no residue or sticky feeling. My customers love this soap base. Easy to color and incorporate f/o. A nice creamy, milky white as goat's milk base should be. Please don't ever change this base! I have tried the detergent free in this base. I prefer the regular GM over the detergent free in this particular base. COMMENTS: Clients return for our Goat's Milk based soaps. They say it leaves their skin feeling very moisturized. Melts easily and releases from the molds perfectly. COMMENTS: This is my favorite soap base of them all! So creamy with lots of lather and the most moisturizing of all the ones I've tried here. It takes color beautifully, but as is it's a nice off-white cream color. If someone asks me which soap would I recommend for dry skin, I say Goat Milk all the way. Used as is or with added fragrance, this is a dream to work with. I definitely recommend! COMMENTS: Holds color and scent well ... customers love it. COMMENTS: I sell my soaps to distribution centers and their customers love the quality of this soap base! Been using it for 11 years! COMMENTS: Moisturizing without being greasy. Hold fragrance and colour well. Unmolds beautifully. Lovely scent and colour on its own. Creamy and smooth texture. COMMENTS: Nice soap, melts excellent. Beautiful lather. Will be back for more! Thank you! COMMENTS: This is my first experience with a goat milk base. It is so much better then anything else I have ever worked with. It is so creamy and has a luxurious feel to it. It lathers very well and leaves my skin feeling great. The goat's milk really does make a difference. Love it, love it, love it!!! COMMENTS: This base is so easy to work with and it holds scent very well. I like to use it in combo with the Oatmeal and Honey bases to make a 3 layer bar - Everyones Fav! COMMENTS: i was wonderfully surprised when I cut into this soap block.So easy to work with,easy to use and we LOVE love love it!! lathers much better than others I have used so this is the one I will stick with!! great Job on this product! COMMENTS: I have tried soooo many different types of goat milk soap from sooo many companies. This is hands down the best. I just can't find any better. COMMENTS: This MP Soap Base is simply superb! Thank you for the quality and value pricing. COMMENTS: I make oatmeal soap by mixing half of the honey mp base with half of the goat's milk mp base, and adding a 1/2c of ground oats plus a T of this fragrance per pound. The resulting soap is phenomenal. It's my husbands favorite of all the(around 20 different) soaps I make and customers keep coming back for more! COMMENTS: Everyone loves this great lather, smells good wit or without FO. Same color all way through block. Great price. COMMENTS: this has to be the best base I have found. I am very pleased with the pricing as well! Thanks for such great service! COMMENTS: Very nice soap base. Color is even and very white. Lather is great also. COMMENTS: Absolutely LOVE this, especially now that you have it in the blocks! Everyone loves it and I get many reorders/requests for this one. "Super price on a super product!" COMMENTS: Same super GM base, just at a better price! COMMENTS: I absolutely love this base. It has a good lather and a great natural scent - I dont even have to use and fo's if I dont want to! COMMENTS: The best soap from start to finish!! Great product. Cant say enough. Best seller!!!! "Hummingbird Springs' favorite soap base"
COMMENTS: This soap base is top of the line. Very pretty and customers love my soap I make from this base the best! "Does the crafters choice premium goat milk soap contain coconut oil? I don't know if any of the listed ingredients are alternative names for Coconut oil. I have a customer who is allergic. Thank you!" Staff Answer Our Crafter's Choice MP soap bases do contain coconut oil. "I need to make 100 3.15oz candy cane soaps and was wondering if using this product would work better than trying to figure out a cp soap recipe to fit the molds? I’m not familiar with my bases...how much FO can be added to 47.25 oz of this base and can you swirl colors? Which colors work best in this base...I want to do a red and white swirl. Which colors won’t bleed? Thank you very much!" Staff Answer A Melt and Pour Soap Base would work very well. We would recommend the Ultra White Base instead of the goat milk because this is a more creamy color. Normal fragrance load for MP soap is 3%. We recommend using pigment colors which do not bleed. You can also make the bars all white, then go back and paint the red stripes on using mica powder blending with a small amount of rubbing alcohol. "I live in a humid climate does this soap sweat alot "
Staff Answer Melt and pour soap contains glycerin and glycerin attracts moisture from the air. If you wrap your soap they are less likely to sweat. "Is this the detergent free version?" "What oils are used in this soap base?" Staff Answer This soap base contains coconut oil and palm oil. When these oils go through saponification during the soap making process, they create sodium stearate, sodium myristate and sodium laurate. "GOAT MILK SB, CAN OILS BE ADDED CAN BUTTERS BE ADDED CAN OTHER MILKS BE ADDEDHOW HOW MUCH OF EACH INGREDIENT AND GOAT MILK?" Staff Answer Oils and butters added to the soap bases can cut down on the lather the soap makes. We recommend reading the directions for the soap bases. A maximum amount of fluid additives of no more than 6% should be added (this includes fragrance added at 3%). Anything more than this will leave the soft soft and tacky and may not harden up completely. "Is the goats milk you use in this soap powdered or fresh?" Staff Answer Hi Stephanie, the goats milk we use is powdered. "Does this base have good suspension properties? Any additives that you would not recommend? Any especially receptive to this base to give good disbursement?" Staff Answer This is not a suspension soap base. We do carry a clear and white suspension MP base. Or, you can also let the soap start to thicken up before pouring. Add your additives then and this should help suspend them in your soap.